Knee walkers are mobility devices that allow you to stay active while you’re recovering from a sprained ankle, a knee injury, or want pain relief from a joint. They usually require a larger learning curve than other mobility devices, but once learned; you will find that knee walkers allow you to travel farther with less effort. Knee walkers also remove the painful pressure points around your armpit that tend to occur with crutches. A knee walker makes it easy for people to get around after surgery or an injury. They look akin to a recreational scooter, with most designed with four wheels, though there are multi-wheel models. Your uninjured leg is used to propel yourself on a knee walker. A knee walker will remove all your weight from your injured leg, minimizing the chances of injuring your leg once again. Not only does a knee walker give you back your ability to come and go, but it also enables you to reach higher places and move around your home without worrying about your hardwood floors or carpeted areas. An all-terrain knee walker builds on the traditional knee walker. They are not only designed to work indoors, but they also work just as well outdoors in different types of terrain. These kind of knee walkers are produced with better suspension and braking systems, to ensure your safety while in use. Not only that, but all-terrain knee walkers have larger wheels, with most being made with polyurethane materials, since it has a better ability to grip onto more slippery surfaces than other types of rubbers. 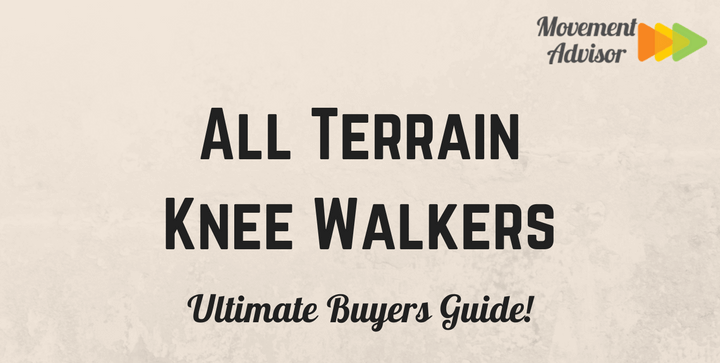 Who Should Use an All-Terrain Knee Walker? Most all-terrain knee walkers can be utilized as a form of rehabilitative therapy, providing the user a renewed sense of autonomy. Even though all-terrain the walkers can work on different types of surfaces, it’s important that you pay attention to your safety while using one. All-terrain knee walkers aren’t designed for off-road usage; they are ideal for parks, unpaved areas, as well as a way to mobilize in and around the home. The KneeRover Pro Knee Walker is designed with an aluminum frame. When compared to other types of metal, aluminum is the preferred metal especially if you want a knee walker that is sturdy, rust resistant, while still being lightweight. Emphasizing its all-terrain features – like 12-inch pneumatic tires – the KneeRover Pro Knee Walker offers maximum stability on all types of surfaces – in and outside of your home. The seating is attached to a suspension system that will absorb the small bumps on an unpaved road, with an integrated shock technology for ultimate comfort. The KneeRover Pro Knee Walker uses aluminum, allowing the mobility device to accommodate up to 400 pounds and a maximum height of 6’5″. Even though it may look like more of a recreational scooter than a mobility device, the KneeRover Pro Knee Walker does not skip out on its promise to help you become more mobile. It’s knee support height ranges between 19 inches and 24 inches, with a knee pad that is more than a foot long, accommodating most people. Off-road tires will withstand impact on rough terrain. Shock technology for a comfortable ride. The Azoob All-Terrain Knee Walker is designed with pneumatic tires for superior shock absorption. Pneumatic tires are air filled, with a reinforced outer ring to stabilize the pressure within the wheel. When compared to a solid rubber tire, pneumatic tires offer superior shock absorption. Instead of a solid piece of rubber used to absorb the impact of hitting small cracks and indentations on the ground, a pneumatic tire is filled with a superior cushion – air. Azoob All-Terrain Knee Walker behaves like a bike, with a steering bar that can have its height adjusted for comfort. With the Azoob All-Terrain Knee Walker you can have its seat removed for easy folding and storage. As an all-terrain knee Walker, the scooter comes fixed with a basket that can be removed. The basket gives you the chance to insert your personal belongings as you propel yourself with your uninjured foot. Compatible with grass, sidewalk, gravel, and compacted dirt roads. Its knee pad is thick and sumptuous, absorbing the shock of the terrain. It can accommodate up to 300 pounds. The purpose of this all-terrain knee walker is right in its name – it helps emphasize your independence and your sense of freedom with a system that has a 30-degree turning radius. This 30-degree range of motion gives you superior mobility, with it behaving almost like a recreational scooter. This removes the learning curve of using the Essential Medical Supply Leg Walker, as it will feel very familiar. Even though it may be small, its compact size is augmented with loop hand brakes and wide tires that allow it to make little work of the small cracks and indentations in the pavement. It can accommodate up to 400 pounds and people up to 6’6″. The brakes could be locked, securing your knee walker into place. This is ideal if you want to rest on your mobility device momentarily. The Swivelmate Knee Walker is a designed for those who do not want to stress over tools, as it can be constructed and assembled with just your bare hands. It has a thicker construction compared to other knee walkers, giving it its strength and durability even when used on extreme terrain. One of its best features is it’s obvious three front wheels, giving you a 90-degree turning radius, significantly more than other knee walkers. This is a premium mobility device, specifically designed to be strong while delivering superior maneuverability. The knee rest is thick and can be adjusted to accommodate people up to 6’6″. The Swivelmate Knee Walker is designed with disk brakes, the type of brakes used on road bikes. These brakes have better stopping power than other types, even working in wet conditions. It has a 90-degree turning radius – significantly more maneuverability than other knee walkers. There are no tools required, making this mobility device ideal for those who do not have the patience or the dexterity to build a knee walker. The Drive Medical Knee Walker is fixed with a pad that is ergonomically designed to fit your knee, offering superior comfort. Other knee walkers are designed with a single padding to support your leg – this one is made of several to contour around your injuries without applying additional pressure. The Drive Medical Knee Walker has hand-operated brakes for stopping power and easy folding for transportation and storage. Its front wheels are steerable, giving it a sense of fluidity superior to other mobility devices. Eight-inch wheels are large enough to accommodate indoor and outdoor use. The front basket that can be removed and replaced. You do not need to leave your personal belongings behind anymore or carry a cumbersome purse. It’s a bit on the heavier side due to its steel construction, but it can accommodate 350 lbs. An all-terrain walker is an excellent way to stay active, isolate your injured leg, and move in and around your home. Many seniors have a renewed sense of confidence with an all-terrain knee walker, satisfying their sense of adventure while being safe.